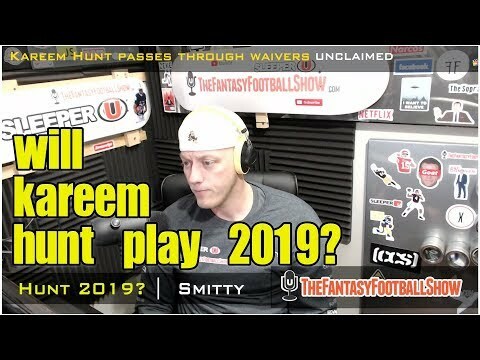 Will Kareem Hunt play in 2019? Awesome video. Does make sense for the owners to make a statement out of him. Young prime player, that doesn’t get picked up after such incident? I could see that happening. Thx buddy. Yeah I mean I think he gets a shot but no one wants the PR now and Goodell could sit on taking him off the list for a year. 1, Roger Goodell will likely have him on the exempt list for the entire 2018 and most of the offseason as there is no rush to figure out a suspension 6-16 game limit for a while. 2, what bally owner is going to want to take on the 'current hot mess' guy in the NFL? 3, Ray Rice's career eneded for a somewhat similar video. don't understand why he should be suspended next year if they're not allowing him to play again this year. just suspend him this year without pay. ^this...and I can't believe people are still comparing this video to Ray Rice's video...not even close. Um- yes it is actually........that is you in the video. He probably should have started by apologizing to the girl first. Joe Mixon got his shot and people forgot about his issues. Hunt will be back after a 6 game suspension in 2019 (on top of not playing in 2018). The question is which team pulls the trigger and has the guts to do so? At some point teams will start to blacklist players that are caught with domestic violence, especially on video. It’s just not worth losing fan base. It sickens me to say this, but the small fan base they lose from bringing on a player like Hunt will more than be made up for by the fans returning/coming in new because of the winning Hunt brings to the team. As a GM - I would probably pick him up in 2 weeks after the initial disgust had passed. ESPN's Dan Graziano reports the NFL is taking into account three separate off-the-field incidents as it considers how long free agent Kareem Hunt's suspension will be. The NFL is investigating Hunt's February altercation with a woman that led to his release from the Chiefs as well as a June incident with a man and a previously undisclosed incident from January. Per Graziano, the January and June incidents are the "types of aggravating factors that can lead the league to impose a suspension longer than the six-game baseline." Hunt's 2018 suspension is going to spill over deep into 2019. Yeah I would think that he'll be playing after a 6 or 8 game suspension next year with somebody. Hunt has been removed from the Madden 19 video game. Kareem Hunt's out of the NFL -- and the virtual NFL too -- because EA Sports says the running back is being removed from the Madden 19 video game. After TMZ Sports posted footage of the former Kansas City Chiefs player attacking a woman in a Cleveland hotel during an incident in February, the video game company says it made the decision to pull Hunt from the game. "We are in the process of removing Kareem Hunt from the Madden NFL 19 roster, Madden Overdrive and Madden Ultimate Team," a rep for EA Sports tells TMZ Sports. Hunt was cut by the Chiefs on Friday and was not claimed by any other NFL team when he hit the waiver wire. Now, he's a free agent but it doesn't appear any teams are actively trying to sign him. the PC culture is very sad. I'd probably sue EA Sports if I owned Madden. The media has blown this way out of proportion. He shoves her a little, shoves a guy quite a bit (and the guys ends up being shoved into the woman, knocking her down), and his "kick" was supposedly a brutal attack. If he gets the Ray Rice treatment for this, I'll likely make my wife very happy by never following or watching the NFL again...which would also unfortunately include never playing fantasy football again. thats Xtreme. The PR & blackballing is getting out of hand. NFL is more worried about Donald Trump than putting out a good product & protecting their players rights. La'el Collins still takes the cake for me. Gets accused & had nothing to do w the incident so the league blackballs him from getting drafted. Would have been a 1st rounder. SO pissed the Broncos didn't pick him in any round that year.......he gets cleared & the Cowboys sign him to a FA deal. How can you not take a flier pick on a talent like that?? Its b/c the league didn't want the backlash. Its become a soft league. C Sutton got flagged last week for hitting a defenseless defensive player when he was around the ball. Defenseless because he was looking @ the ball carrier not the guy coming to block him. Put flags on these guys & move on. The Broncos are scared of upsetting anyone in the NFL front office. Joe Ellis and crew don't want ownership made an issue. Just read that Nagy (bears coach) said he talked to Hunt on the phone to see how he was doing. Said he would not rule out signing him. Nagy was Hunts Oc last year 17’ season in Kc. I agree. With the defense and a solid running back in place, would be a great fit in a Chicago. Would love to see this happen. I disagree. With Howard and Cohen already there, I think that would be one of the worst landing spots for him. well Howard wasn't exactly terrific. Cohen is a different kind of back. Sure they could use a bellcow & still use Cohen. I believe it’s because they were in an RBBC. Can you imagine if they brought in Hunt? Good for the Bears bad for FF!